The Enchanted Forest Chronicles, by Patricia Wrede – This is a series of four books: Dealing with Dragons, Searching for Dragons, Calling on Dragons, and Talking to Dragons. The last was actually the first written, but after Wrede was convinced to write three prequels, she revised it a bit to bring it more closely into line with the rest of the series. This means that, if reading them in chronological order, you’re already going to know most of the plot revelations in Talking. The cast remains pretty consistent, but Wrede purposely chose to give each book a different main viewpoint character. Dealing focuses on Princess Cimorene, who tires of her royal life and goes off to keep house for a dragon. In Searching, King Mendenbar of the Enchanted Forest joins forces with Cimorene to fight against a magical plot, and they end up getting married. The major protagonist in Calling is Morwen, a somewhat non-traditional witch who keeps a lot of cats. And in Talking, the only one written in the first person, Cimorene and Mendenbar’s son Daystar has to rescue his father. Other recurring characters include the Dragon King Kazul (who’s female despite her title; gender is a matter of choice among dragons anyway), a magician named Telemar who speaks in complicated technical language, the scheming members of the Society of Wizards, and a rabbit called Killer who has an unfortunate habit of eating magical plants. As the series developed, it came to be a fantasy world where the characters were genre-savvy, knowing how fairy tale plots and archetypes were supposed to work. It’s played for humor, but never becomes all-out parody. I’ve read other books and series that used a similar premise. Ruth Plumly Thompson played with it; and Diana Wynne Jones’s Howl’s Moving Castle shows the downside of such genre knowledge, in that, since first-born children pretty much always fail in fairy tales, Sophie was resigned to a dull life until she took matters into her own hands. Among other references to traditional tales, there’s an appearance by Rumpelstitskin’s descendant Herman, the joke being that his name is comparatively quite easy to guess, but no one ever does and he ends up having to take care of a bunch of children. There’s a bit of an Oz reference as well, in that wizards can be melted with a mixture of water and lemon. It only takes them out temporarily, however. It’s suggested that it usually works on witches as well, but Morwen is able to avoid it through her cleanliness. 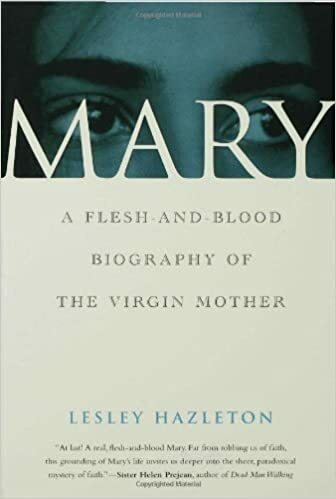 Mary: A Flesh-and-Blood Biography of the Virgin Mother, by Lesley Hazleton – While well-written, this book struck me as more historical fiction than biography. But then, unless you’re just recapping what others have said, we don’t have that much information on Mary. She’s a significant part of theology, particularly for the Catholic Church, but the little information on her we find in the Gospels is fragmentary and often contradictory. At least she fares better than her husband in this respect. As Hazleton points out, only the Gospel of John even mentions Mary’s presence at her son’s crucifixion. The book touches on some of the legends that developed about the woman, including the story in the Protoevangelium of James about her being brought up as a ward of the Temple and the rumor that she was raped by a Roman soldier. Most of it just seems to be supposition on Hazleton’s part, though. She proposes that Mary was a village healer, which is how Jesus learned his healing skills. There’s also the suggestion that Jesus was younger than the Gospels say when he was crucified. Why? It’s rooted in the idea that it wasn’t common for Galilean peasants of the time to live into their thirties, but I don’t think there’s any actual evidence for it. It’s not a bad read, but I can’t recommend it as a work of history. This entry was posted in Christianity, Fairy Tales, History, Magic, Middle East, Religion and tagged bible, calling on dragons, dealing with dragons, dragons, gospel of john, gospels, jesus, lesley hazleton, mary, patricia wrede, protoevangelium of james, rumpelstiltskin, searching for dragons, talking to dragons, the enchanted forest chronicles, virgin mary, witches, wizards. Bookmark the permalink. “Tiberius Iulius Abdes Pantera (c. 22 BCE – CE 40) was a Roman soldier from Sidon. If that was his only claim to fame, nobody would care.